At the time I was drafted in September 1967, I had a close relationship with my mother, father, an older brother who was already in the Navy, and my pet beagle. I regretted leaving them, but I had to do the honorable thing. I wish I hadn’t been drafted, but I knew it was my duty to serve. No matter what my opinions were about the draft, I performed as best as I could to help out my country. The men I served with also had the same opinion as I did: none of us wanted to be there, but we knew it had to be done and served with dedication. My basic training prepared me for “normal warfare,” as well as for jungle and guerrilla warfare. I learned what I needed to survive in Vietnam. I was given training by a first lieutenant who had already served in Vietnam. This made me feel prepared for what I was about to face. In a mock Vietnamese village in Ft. Campbell, KY, I became familiar with the tricks the enemy would try to use against us such as booby traps, trip wires, and other hidden explosives. As we were preparing to deploy, I found my assignment was the 25th Infantry Division, Tropic Lightening. This put me at ease to some degree, since I had experience in the field of mechanics and radio operations, which would be my job in Vietnam. Once overseas in August 1968, I found out that I was part of the 25th Medical Battalion of the 25th Infantry Division, where my expertise was needed the most. Arriving in Vietnam was very overwhelming. Planes were constantly flying in and out, and people were always on the move. When we got to the base camp at Cu Chi, our barracks were in horrible conditions. One of my friends was a carpenter, and he helped oversee the construction of all new barracks. We were the lucky division. Each day I had certain duties to perform at camp along with the duties of our entire unit. Every morning I would get up and dressed at 6:15 AM and prepare for a 7:00 AM briefing. This was a support command briefing. I reported the details to the S 2-3 officer, who is in charge of operations and intelligence. During the meeting, I would take notes on the reports, as well as help conduct the meeting. (This report included the previous day’s casualties, where each unit was located, and so on.) These meetings were confidential, so I felt very lucky to know what was going on around us! I also helped out at the meeting. We had a large map of locations and operations of all of our troops in the room, so it was my job to keep the map up to date. This was very important, especially when a call came in requesting a rescue mission for a wounded soldier. In the afternoon, I had many other jobs as well. I was a Security Clearance NCO for my battalion. It was my job to make sure soldier coming in or out of the base camp was authorized. Each day, I also checked the radios of every soldier in our battalion. I made sure each had plenty of fresh batteries and was in good working condition. I was also given the new job of Operations NCO and was promoted to E-5 status; they gave me this promotion because of my previous administrative and clerical experience. About 3:00 PM, we had another daily briefing at Command Support Headquarters. These reports contained information regarding the current status of operations, and also gave us classified intelligence reports. Another important duty of mine was checking gas masks, and keeping a checklist of all necessary supplies. 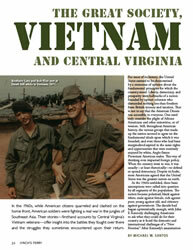 Since Cu Chi was between the Ho Chi Minh Trail and Saigon, all supplies came through our base camp. Nights could be rough in Vietnam. We had sayings like, “Stay Alert-Stay Alive!” and, “The Night Belongs to Charlie,” warning us of the dangers that came in the dark. We experienced many mortar rounds and shell/rocket attacks on our barracks. When incoming fire was heard, we immediately hit the floor and assumed “red-alert status.” When there was a break in the firing, everyone got into the bunker. Once it was determined that it was safe to return to the barracks, most people resumed sleeping. I, however, had to assess the damage done and report to my commanding officer what was damaged, destroyed, and if there were any injuries or casualties. Luckily, no injuries happened in the 25th Medical Battalion during these attacks. I was pretty busy most of the time, but when we had free time, we had just a few options for recreation. My fellow soldiers and I were very close, and enjoyed each other’s company. In the evenings, we would put together a game of basketball or volleyball, or sometimes just sit around playing Monopoly. A few soldiers resorted to smoking marijuana, but my close friends and I always found other ways to relax. One day towards the end of my tour, my buddies and I needed a little fun. They decided we should go into Saigon and eat at a fancy restaurant. I didn’t think it was a good idea since snipers were waiting outside the camp, but eventually I gave in. This was our last chance to just hang out with each other before we all went home to our families. We were all very ready for that by this point. While I was in Vietnam, I was constantly thinking about getting to leave for the U.S. When I finally got to go, I was shocked by the amount of controversy that had arisen while I was overseas. I came home as part of the troop reduction in August of 1969, but many people were lining up to leave before their tours were over. We felt that the war was “unwinnable,” so I was glad to get out before it got any worse. I spent a week in the transportation detachment preparing to return to the U.S. When we got back, I found out that American citizens didn’t want troops in Vietnam any more than we wanted to be there. It was disconcerting to be greeted at the airport by protesters picketing and spitting at us. I did the best job I could while overseas, but I couldn’t wait to get home to my family.